These plates are used by New and Used motorcycle dealers. This type started around 1912, in a C12D format. In 1914, when the 'CONN' legend was added, the numbering was simply 12D. Colors were the reverse of normal motorcycle plates as was done with car dealer plates. Starting in 1917, the colors became the same as regular motorcycle plates. Around this time new dealer plates were issued with an 'X' prefix and used have a 'D' prefix. Sometime around 1962, Motorcycle Dealer plates started using the same annual alternating-color scheme as car dealer plates. Even years were white on blue, odd years blue on white. This continued until the 1980 plates, when decals were used. In the late 1980s or early 1990s the colors were reversed from normal motorcycle plates to blue on white. When the annual issues started again with the 1998 expiration, colors were the same as car dealer plates - however, the prefix was changed to 'MX'A- for new dealers, and 'MD'A- for used dealers. This type first appeared in the registration books in 1920, though they may have been issued earlier than that. 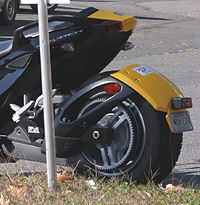 Motorcycle sidecars used to have a separate license plate, in essence a "commercial motorcycle" plate (the colors were reversed like commercial truck plates as well). Since commercial truck dealers had SX plates, why wouldn't commercial motorcycle dealers as well? In 1920, numbers 1 through 50 were issued by April, with 52 and 53 issued by July. This is not a very common type. 1925. This plate was poorly repainted in the wrong colors when I obtained it. As much as I hate to repaint plates, this one could not get any worse than it was. This how it eventually turned out (the colors did not scan well).